BAKE LIKE A TRUE PRO - Looking to treat your friends and family to beautifully delectable baked goods? 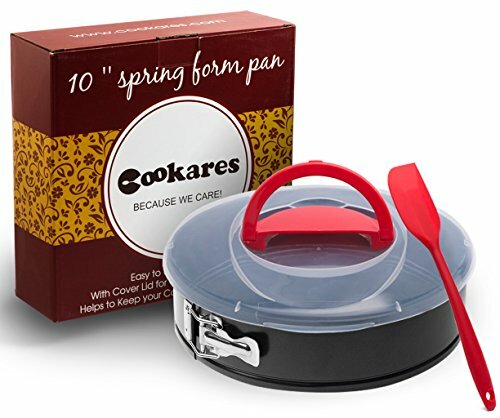 Let the Cookares 10\" springform cake pan make your time in the kitchen count! Our professional grade carbon steel ensures you\'ll always get uniform baking, and the non-stick coating means your cakes will always come out perfectly. TAKE YOUR CAKE AND STORE IT TOO - Your kitchen is cluttered with enough odds and ends, so the last thing you need is another single-tasking gadget. Cookares isn\'t just a dream to bake with, it works triple duty as a storage and carrying container for your cake creations. The lid features a convenient handle for carrying your cakes on-the-go, and always keeps baked goods airtight and fresh in the fridge. NO MUSS, NO FUSS - Don\'t waste any more time with unnecessary messes! With Cookares, you can bake without fear! Not only does our non-stick construction make post-baking cleanup a breeze, but our dependable construction also makes our spingform pan leak proof. Now, even the thinnest cake batter will stay inside the pan, instead of all over your oven! SWEET FREEBIES - Prepare to be the dessert master! When you order from Cookares you get everything you need (except the ingredients) to make sweet treats that will have everyone\'s mouth watering. Decorate your masterpieces with the FREE silicone spatula, and get baking inspiration with the FREE Recipe eBook, \"Simple & Delicious Cake Recipes.\" Order Now! Your taste buds and your friends will thank you! EASY AS PIE GUARANTEE - Unlike other brands, at Cookares we never want to leave a bad taste in your mouth! That\'s why your 10\" springform pan comes with a 60-day, no questions asked warranty. If you aren\'t completely satisfied with your nonstick baking pan, send it back for a full refund! It\'s that simple.